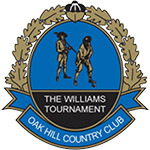 ROCHESTER, N.Y. (September 13, 2018) - Craig Hosie and Harris Bundy, both of Toronto, shot a 6-under 64 to take a one-shot lead into the second round of the 56th annual John R. Williams Invitational at Oak Hill Country Club. They lead by a single shot over two teams. Andrew Kay (Pittsford, N.Y.) and David Fries (Penfield, N.Y.) shot a 65 in the morning, while Jeff March (Penfield, N.Y.) and Francesco Romano (Ashburn, Va.) matched the score in the afternoon. The field will be cut after tomorrow's second round. The current cut line is even par, with 37 teams at that score or better. 54-hole two man best ball format. By invitation only. Entrants must have a handicap of 3.4 or less, with the team total not to exceed 5.5. Both members of teams in the Senior Division must be 55 years of age by the first day of the tournament. Senior index requirements are 4.4 individual and 7.2 team.